SKU: BIO17360. 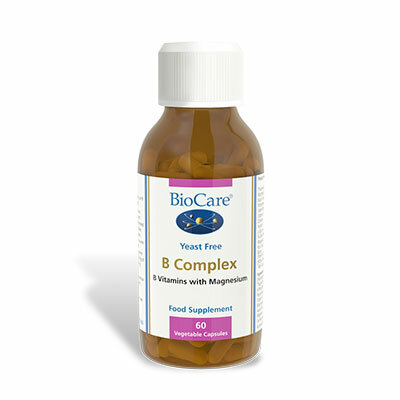 Categories: Best Sellers, Vitamin B Complexes. 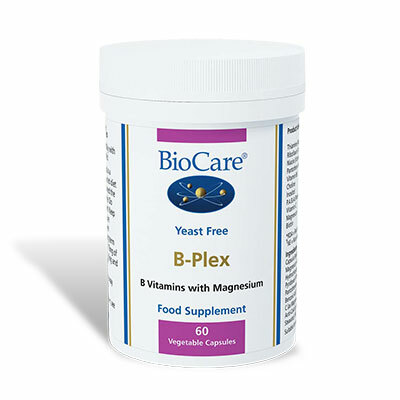 B vitamins are required for the release of energy from food, for the healthy function of the nervous system, for the correct balance of hormones and for increasing the ability to deal with stress. B vitamins are important for releasing energy from food, growth, development and function of the nervous system. Contains L-Glycine to ensure utilisation of the B vitamins and magnesium to support energy metabolism and the nervous system. One capsule daily with food or as professionally directed. Magnesium Gluconate, Capsule Shell (Hydroxypropyl Methylcellulose), Thiamine (as Thiamine Hydrochloride), Vitamin B6 (as Pyridoxal-5-Phosphate),, Pantothenic Acid (as Calcium Pantothenate), Riboflavin, Niacin (as Nicotinamide), Vitamin C (as Magnesium Ascorbate), Choline Bitartrate, Inositol, L-Glycine,, Para Amino Benzoic Acid, Anti-Caking Agent (Silicon Dioxide & Magnesium Stearate), Folic Acid, Biotin, Vitamin B12 (as Hydroxycobalamine). Fantastic!! Thanks ever so much Sue – what lightening speed service!! This will help very much as * has almost run out of them. I shall make sure we have some in reserve next time to avoid any panic! A big box of supplements arrived today which I’m about to explore – really fast service so thank you for that. I’ve received my order and started today my treatment. Thank you very much for your fast actions. I am planning to use your website regularly and recommend to others.